Reducing muscle size is much easier than increasing muscle size and requires a lot less work. Although it may seem a bit unconventional, the desire to reduce muscle size is more common than you may think. Athletic women, for example, may wish to reduce the size of muscular thighs to achieve a slimmer look. It is possible to reduce muscle size by simply becoming sedentary, but that is not a very healthful approach. Whether you want to reduce a certain body part or size down your entire body, you can safely and healthfully reduce muscle size. Decrease your daily caloric intake. Muscles are a metabolically active tissue, which means they require calories simply for maintenance. If you reduce your caloric intake, your body will not be able to sustain your large muscle size, and your muscle size will decrease. The lower caloric intake may also require your body to use some of your muscle for energy. Reduce your caloric intake by about 250 calories per day. Perform cardiovascular exercise regularly. Prolonged cardio sessions will add to your caloric deficit while still working your muscles. Total body exercises, such as running, swimming and rowing, are ideal because they work more muscle groups, which in turn burns more calories. Aim for at least 30 minutes of cardio five days a week. Avoid eating a post-workout snack. In order for your muscles to repair themselves and get bigger, they must be given adequate nutrition directly after your workout. However, if you skip the snack your muscles will be unable to repair and grow. This will eventually lead to reduced muscle size. Wait two to three hours after your workout before eating. 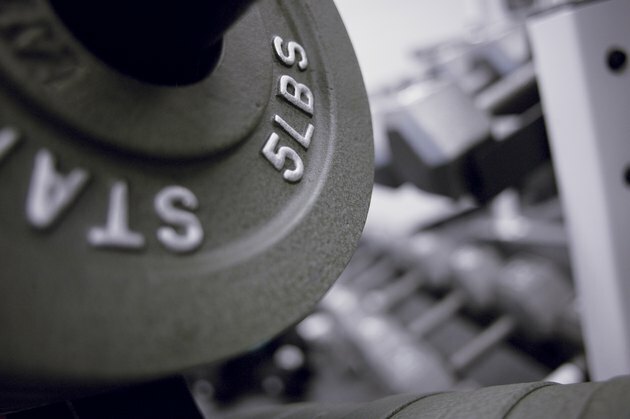 Decrease the amount of resistance used while strength-training. The American College of Sports Medicine recommends using 70 to 85 percent of your one-repetition max to increase muscle size. You will want to use significantly less than this. Use only your body weight or very light resistance when performing exercises with the muscles you want to reduce. 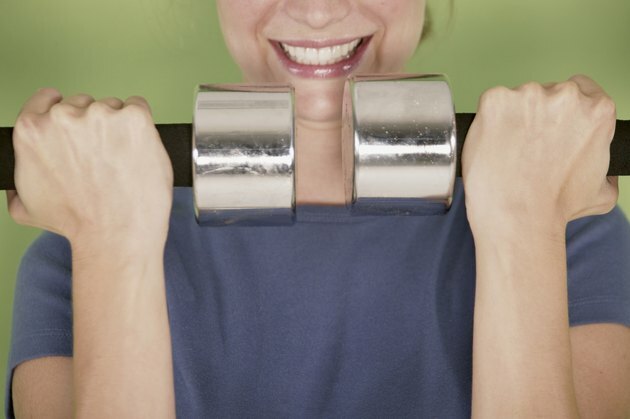 Increase your strength-training repetitions. 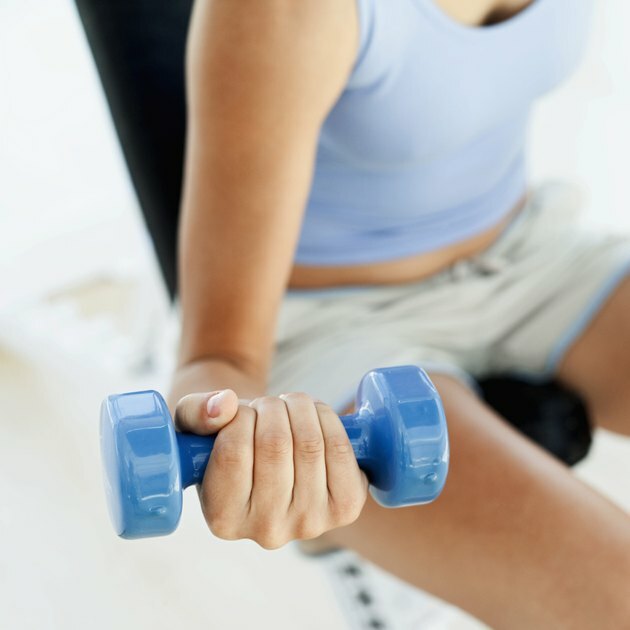 To gain muscle you should use high weight and do only eight to 12 repetitions. By decreasing the weight and increasing the repetitions, you are no longer eliciting muscular growth but rather endurance. This technique will help you keep muscular tone and strength while reducing muscle size. Perform 30 to 50 repetitions of each strength-training exercise. Minimize the number of strength-training workouts. Rather than hitting the weight room four to five times a week, aim for two to three days. You no longer need to stress your muscles to invoke a training response, so lifting less than your normal is the goal. Decrease your trips to the gym by one to two days a week. If you previously strength-trained three days a week, try for one or two days a week instead. Consult your health care provider before beginning a new exercise program.